Since we lost our boy his sister got quite lonely, and eight months after he passed away we got the opportunity to adopt a stray kitten who was in need of a home. 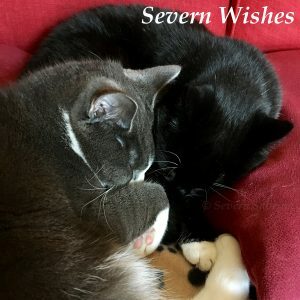 We know we are incredibly lucky with our cats, not just that they are affectionate to us, but also because they get on really well together considering they aren’t related. Here are all three of our fur babies. Our angel in the stars ✩♡✩ on the left, his sister is in the middle, and she turned 8 this week! And finally our youngest is on the right, she will be 2 this June! 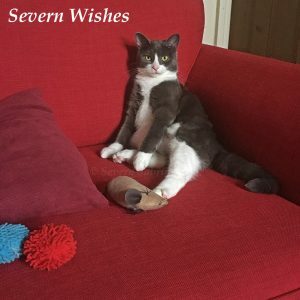 I’m writing this blog post to show people how happy my indoor cats are, providing they have the necessary toys, water and food, and of course their own space, there is nothing wrong with keeping your cats indoors. Furniture was hugely important when we made the decision to keep our original two as indoor cats. There were several reasons, one was due to living metres away from a main road, another was due to neighbours keeping dogs in their back gardens, and finally because of our boys health problems. We purchased three main pieces, one was from Argos and two were from Pets at Home. 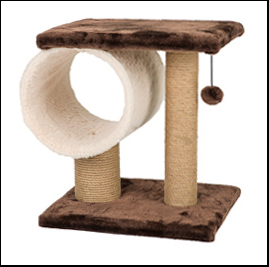 When choosing cat furniture and scratching posts always introduce them together, and encourage the cats to use them. If you make it fun as kittens they are more likely to continue with it on to adulthood. Choose items that won’t become a nuisance in your rooms and that blend in with the shapes you already have. There are some awesome trees out now, that are even designed to fit into corners of the room. You can pay around £100 for these sorts, but if you maintain them with regular trimming and hoovering they should last several years. We had a cream cat stand from Argos back in 2010 when we first got our kittens from the rescue cattery. It was around £30 at the time, and it lasted us for the next seven years! 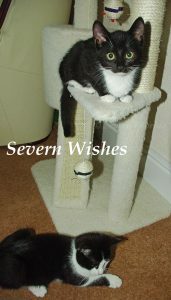 Here is a shot of our original two rescue cats when they were tiny kittens using the stand all those years ago! It gave them so many hours of fun and also was somewhere soft to sleep until they got bigger. We replaced it in 2017 with the new version, one in grey, an almost identical shape, they just changed the colour and made the base piece more sturdy. Perfect! The colour goes well in most rooms and it stands at 85cm tall. 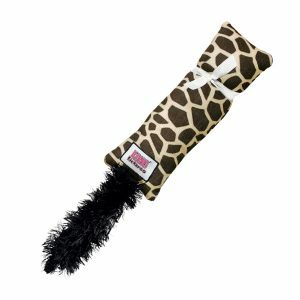 The material is soft fleece and easy to hoover with our pet attachment. 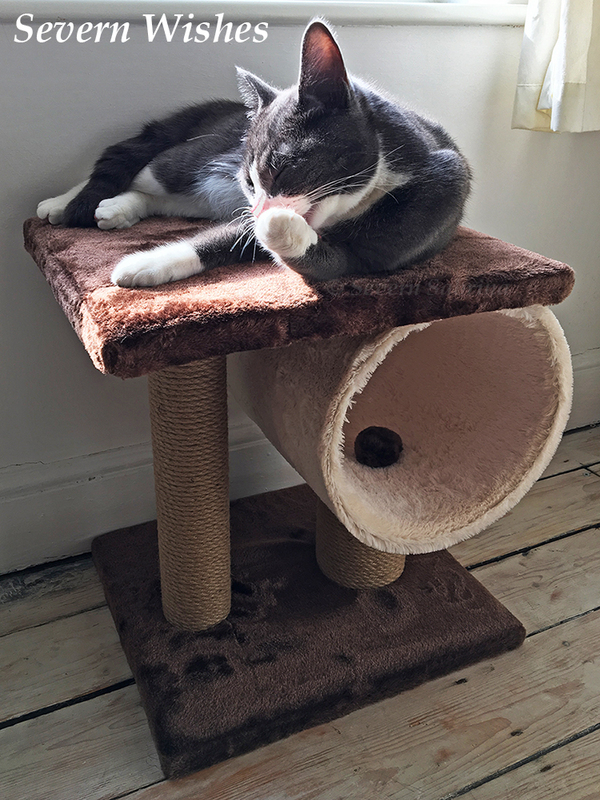 It has scratch posts attached and a hiding hole for cats to go into, however we use that to store all their toys when not in use – super handy either way! Here is our youngest, she loves to sit up as high as possible and watch what everyone is doing. As you can see, she is a fully grown adult cat and still fits nicely across the top of this particular cat stand. We use the section inside the drum to store some toys. Our other main cat unit is this one, it is brown and cream and has a lovely large section for the cats to lay across. It’s situated upstairs so it gets the light in the afternoons. 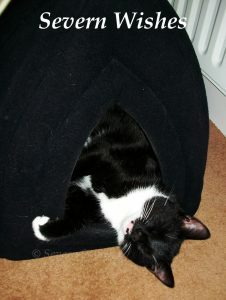 As our youngest demonstrates there is more than enough room for an adult cat. Cat beds have been one of those items that are used periodically in our house. If it’s during the cooler months of the year you will often find the cats curled up inside the pyramid bed or on a cushion bed near a radiator. But in the summer these don’t get much use. I often decide to wash them in the summer, dry them outside and then set them to one side, this totally refreshes them ready for the autumn. 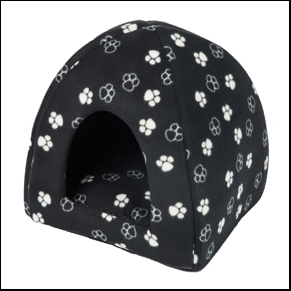 I would recommend getting the ones with removable covers or cushions that can go in the washing machine, Argos, Pets at Home and various large independent Pet Stores should do ones of this kind. They range from £12 to £40 depending upon size and quality of material, but we have never paid more than £20-£25 for one of ours, and most of them are several years old now, still going strong. Here is our eldest in her Igloo Pyramid Bed, they changed the design recently to incorporate the paw prints on the outside as well as the inside. Ours is all black but otherwise identical to the one I have mentioned above. Bought from Pets at Home back in 2010 however! We bought the matching round donut bed at the same time too! The girls are ready to play! 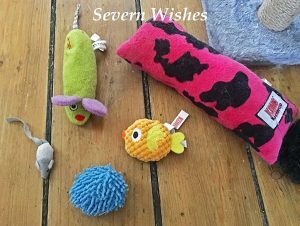 As for cat toys ours do like a real mixture and it can depend what mood they are in as well. They adore Ping Pong balls, Rattling Mice and the range from Kong which contain catnip. I bought coloured Ping Pong balls from Amazon and white ones from the local Pound Shop – these get an awful lot of use in our house and they often go missing for days and then turn up (usually under a unit or chair), so it’s good to get a few in! 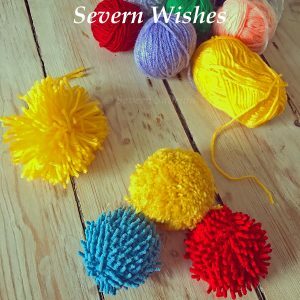 You could also consider making your own toys such as Pom Poms! But you need to supervise play with these items for sure as cats usually pull them a part! Resting after some pom pom play time! 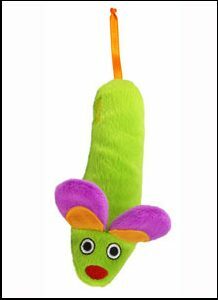 Other toys like Mice we have bought from Pet Stores such as Pets at Home. Here are a few items that are still available to buy out of what we have recently gotten for our cats. Some of our toys are looking old but they are well loved and well used. 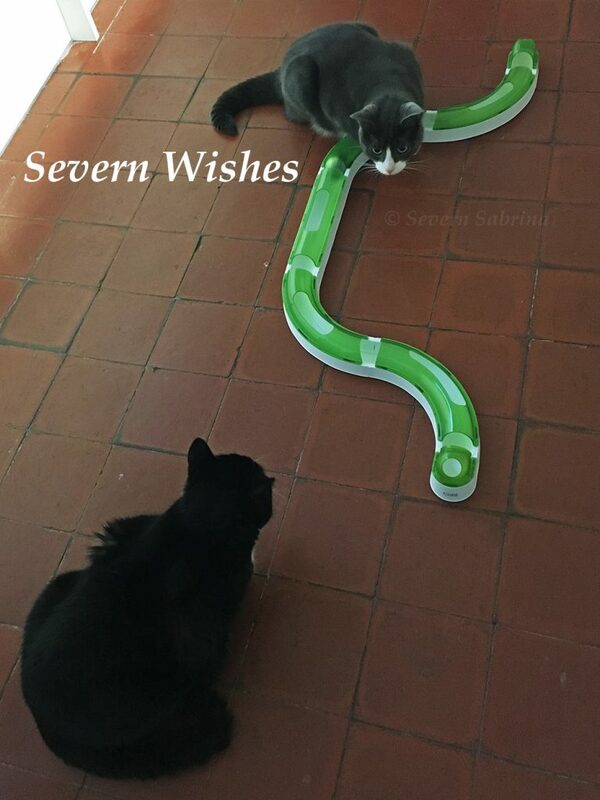 Here are our two on Christmas morning playing with their new layout (green), this was the second Catit Senses Track we had gotten them. The image above shows their first one, a blue one we left in a circle. They love it! Something else that may encourage your cat to scratch “it” rather than your furniture is a Kong Kickaroo! 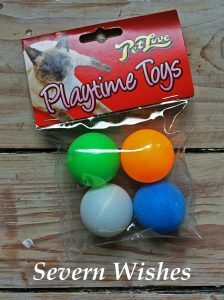 These can be bought from Vets that stock them such as Vets 4 Pets or from some larger Pets at Home stores. Made in the USA they come in several sizes for both kittens and cats. They are like giant sausages that contain catnip, they have a pattern of fleece and are finished with a soft feather-like end. Ours take a real hammering of back feet and claws on a daily basis, and the cats have yet to ruin one! We have three of them and they are dotted around the house so the cats get the most out of them. It’s pretty hilarious sometimes when they “have a go at one”! 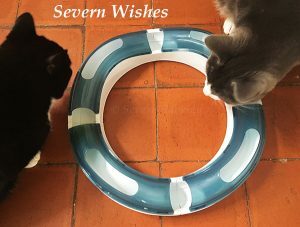 Each cat was bought one after their first ever annual injections and the tradition just stuck! These Kickaroo Toys are awesome! Good quality material, even though they are well used in our house our cats have yet to rip one open! 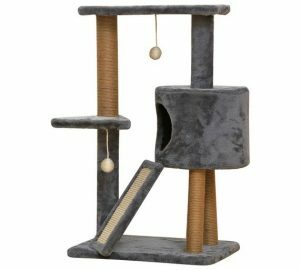 When we move house I would like to purchase a large cat tree from a company whose page I found on Facebook. They are UK based and do them in a range of colours and sizes to suit all homes. I want my cats to have somewhere high up to escape to, once my baby begins moving around independently too. 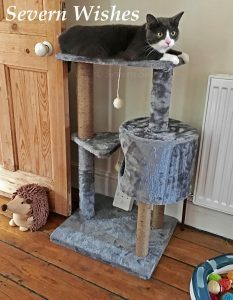 The page is called Cat Tree UK and I like the look of their items and prices, though I will continue to read reviews in the mean time. 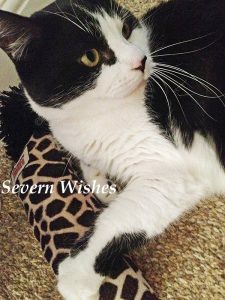 Thank you for reading this blog post today, I hope that you have enjoyed looking at my life with my cats and seeing them having fun with an array of awesome items! Any questions about products just send me a comment, I’m happy to answer any that I can! 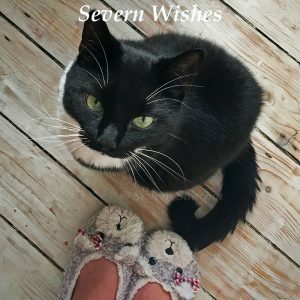 This entry was posted in Amazon UK, Argos, Cat Related, Family, Furniture, Home Sweet Home, Homeware, Lifestyle, Pets At Home, Photography, Reviews, Shopping, Toys by Sabrina. Bookmark the permalink.